McMuffin Casserole Recipe - canadian bacon, english muffins, cheddar cheese, eggs and milk - all the flavors of an Egg McMuffin in a breakfast casserole. Try it with syrup - yum! This is one of the best breakfast casseroles that we've made. It has all the flavors of an Egg McMuffin in casserole form. This casserole is assembled in minutes the night before and baked when you are ready. I used Bays English Muffins - my favorite. They are found in the refrigerated section of the grocery store, near the milk. Chicken Legs loved this. He wanted me to contact McDonald's and get them to add it to their menu! I agreed that this was great. 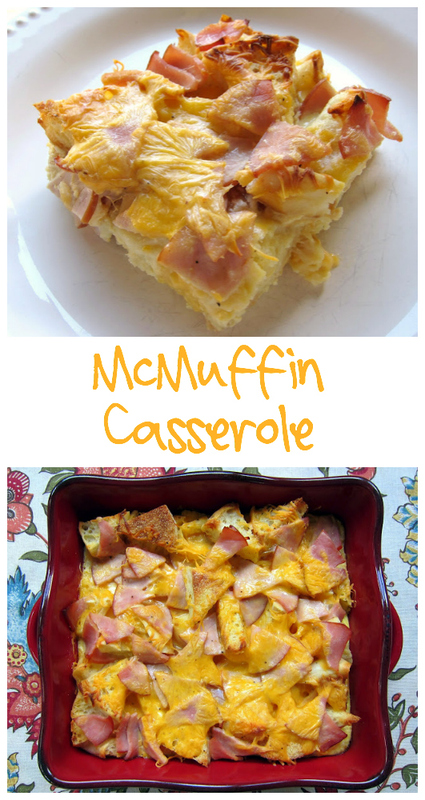 I am not a fan of McMuffins, but I loved this casserole. Chicken Legs added syrup to his second piece to make this a McGriddle Casserole. Add half of the cubed English muffins in a single layer. Top with half of the Canadian bacon and 1/2 cup of the cheese. Layer the remaining English muffins and Canadian bacon and 1/2 cup more cheese. Bake at 325 degrees 45 to 50 minutes. This sounds so good! Can't wait to try it! Bays has the BEST English Muffins! I make a breakfast casserole all the time, but never did it with English muffins. This goes on the To Do list. This looks to good to pass up. I absolutely love Bays English Muffins...and now I have a wonderful recipe to put them in. I'm on my way to the store to buy so Bay's English Muffins and I'm going to have this for lunch today!! Thanks for all the great recipes Steph! Your blog is my favorite for recipes!! OMG - something homemade that taste like McGriddles? Can't wait for Saturday to try this. I know I should be more sophisticated but McGriddles are the best food ever! How do you keep coming up with these creative ideas for delicious meals. Larry - all I ever think about is food! Chicken Legs too. Yum!! I can't wait to try this!! Oh definitely trying this one! Just mentioning the dish's name to my husband elicited a positive response! This. Is. Amazeballs. Egg McMuffins are my fave! Ha! I love the McGriddle version! I also love Bays English Muffins and find that McDonald's Egg McMuffins are often rubber! Definitely on my to try list! Tetszik a blog,és az ételek! McMuffins are my weakness!!! This looks soooooo good!!! I always get the egg mcmuffin! I am now walking along hotels near green park to get English muffins since that's the closest I can get with this amazing recipe. This is a delight to see! There's this great muffin house just right across the broadbeach resort cottage we have rented this summer. However, I would never miss out on this delicious recipe you have posted. How do you do these amazing recipes, anyway? Impressive! I'm making this one plus doing it with sausage since I like sausage mic muffins better. Great idea Bretta! I am going to try that next time. I like sausage mcmuffins better too. I tried your recipe and this came close to the muffin I tasted from a catering company in Australia. It's unbelievably delicious, I can't believe I would be capable of doing it (with the help of your recipe of course). Thank you so much! This is looking so fine. It seems like an easy casserole to make and since I have bacon and ham on stock, I might as well try my cooking skills. Wish me luck! Looks and sounds right up my alley! Everything I have made from Plain Chicken is always delicious and easy, thanks! I have yet to make any of your recipes I pin (which a good portion of my food board is!) but I love Egg McMuffins & am rarely up and out of the house in time to get them, so this will definitely have to be a recipe to try soon! I look forward to it; I only read good things about your recipes in comments- seems like they're all pretty good! Made this casserole this morning for some friends who were coming over. Everyone loved it. Thanks. No - I just chopped it and baked it in the casserole. Has anybody tried it with sausage? I haven't tried it with sausage, but I think it would be delicious!